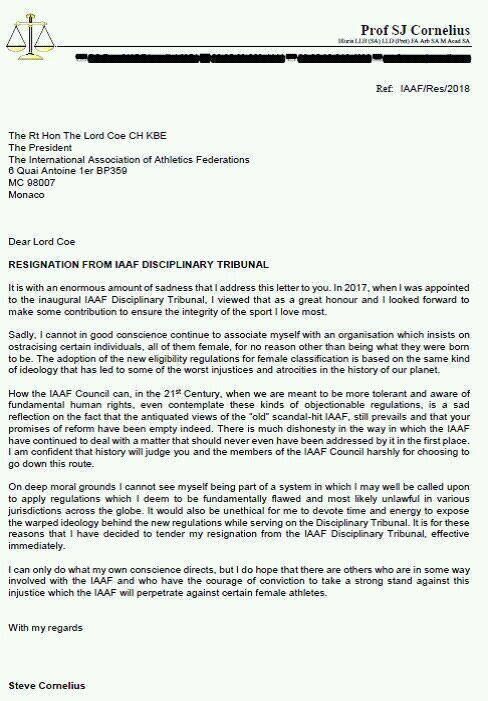 South African law professor Steve Cornelius resigned from the International Association of Athletics Federations (IAAF) disciplinary tribunal following the announcement of the new laws on female testosterone regulations. He had served on the disciplinary tribunal. Professor Cornelius told Azania Mosaka on 702 that it was not an easy decision to make. When I realised they were embarking on these regulations I started to contemplate what my reaction would be if indeed they are published. So I think by the time they published the regulations I had probably made up my mind and I was waiting to see the exact content. So today we tell Caster Semenya, your testosterone is too high you are not allowed to run. Tomorrow we tell someone you are too tall to do the high jump...where does this end? And that for me is a big problem. Social media applauded the professor for taking what they call a bold step. This is as damming a resignation letter as I've read in a long time. Sports scientist Dr Ross Tucker provides an in-depth explanation of what the new IAAF regulations mean. Doctor in Sport Science at UCT, Habib Noorbhai shares his insight on the latest IAAF laws on female testosterone regulations. What do the new IAAF laws mean for Caster Semenya? The IAAF has introduced testosterone level limits for the 400m, the 400m hurdles, the 800m and the 1 500m races. She faces ongoing complaints from rivals about having an "unfair advantage" on the track, but how fair is this proposed IAAF rule? Caster Semenya claimed her second gold of the Commonwealth Games when she came first in the Women's 800m final.